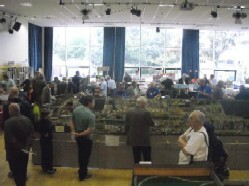 The clubs 75th Anniversary Exhibition in 2005 was the first public showing of the layout, and it has had many outings including to national shows at both Warley and the 0 Gauge Guild shows at Kettering and Telford. Since its first outing it has been extended to its present size and had improvements made to the scenery. 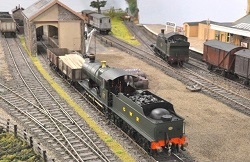 Based on GWR Branch Line practice somewhere in the West Country, the layout has been designed to be run as a GWR scene in the 1930-40’s and as BR practice in the 1950’s until the Beeching closure plan. 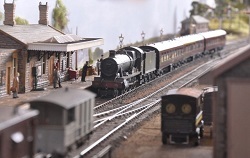 Long term, the group are considering adapting the layout to also represent a preserved line. The current buildings can be removed so changes can be easily made and so introduce some of those modern structures that are often seen at such sites. This gives the group an excuse to run anything they want from a dock shunter to a 47 diesel! 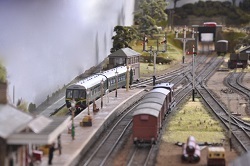 Trackwork is basically Peco with handmade C&L pointwork built by O Gauge section member Don Neighbour. 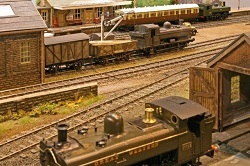 Buildings are mostly scratch built with the station based on Abbotsbury. 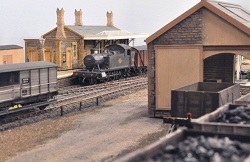 The Goods shed is a modified card kit. 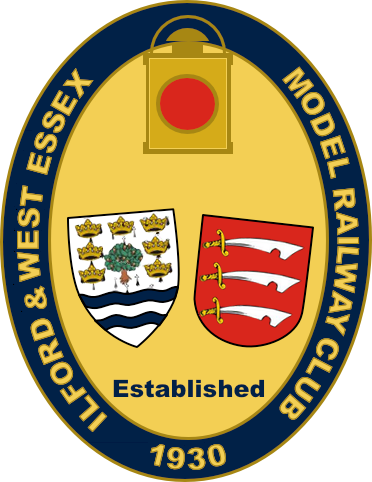 Most of the Locomotives and Rolling Stock are kit built, and made by group members. Built for lasting operational interest and the expressed pleasure from visiting viewers when it is exhibited, the team await the next opportunity to share their work.